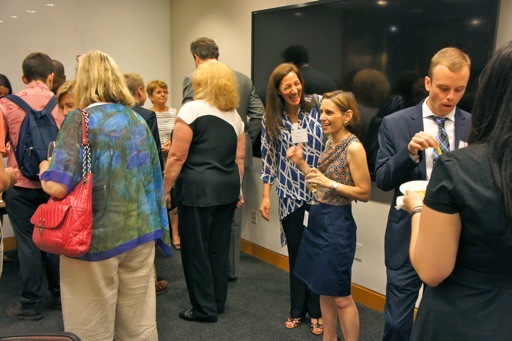 Bunny Ellerin (3rd from right, in dark blue skirt), President & Co-Founder of NYCHBL, greets constituents and guests at the reception before NYCHBL’s panel “The 3D Printing Revolution Meets Healthcare” at Cooley LLP, New York City, 17 June 14. Healthcare is one of America’s most conservative businesses. Yes, practicing at the doctor level can present life-or-death circumstances…literally. So, it’s hard to fault healthcare (HC) practitioners for their inherent prudence in the interests of patients. In the U.S., the furtherance of HC business is coupled with the furtherance of HC science. In America’s hyper-capitalist society, it’s hard not to co-align the two. Still, the HC industry today is seeking the most effective balance of (often conflicting) interests. In fact—for the rapid betterment of American healthcare delivery (better results at a lower cost)—it may be essential to assure that we integrate HC business and science as closely as possible. The sought-after result is an improved “art” of HC for more Americans. (Measured against all industrialized countries, the cost of U.S. HC is far-and-away the highest—while delivering results that are mediocre…or worse.) For our larger society’s benefit, HC—the enterprise—now has a great opportunity to deliver the greater art of human health. Our HC industry can achieve new levels of HC art by harnessing, integrating, disseminating and managing the accelerating advances—and seemingly constant breakthroughs—in medical technology today. Many of the most startling—and far-reaching—innovations in healthcare are emerging from the 3D printing (3DP) segment. HOWEVER—to do so—we circle back to the problem of inherent conservatism in the HC industry. Prudence rarely empowers profitable market penetrations. Now, New York City is—by dint of its liberal approach to matters social, educational, institutional and technological—a locus for potential change in HC worldwide. The City’s HC industry is one of its largest by commercial impact—and, by headcount in the HC ecosystem, likely its largest employer. New York City is also the world’s epicenter for 3DP. We count among our 3DP players the planet’s commercial leaders in desktop 3D printers (MakerBot of Brooklyn) and 3DP service bureaus (Shapeways of Manhattan and Queens). We also have one of the first “colony’s” of a new human hybrid. This is the Techreative. Consider the NeoBrooklyn commercial “hipster”—tech-savvy while art-enthused and infused. Able to mate left and right brain sensibilities to create startups from the Bits2Atoms of 3DP: Thought Into Things! NYC is so 3DP-endowed that it is currently—willy nilly—pulling together the critical mass to create an industrial-segment “cluster” for 3DP. Such a cluster achieved would form THE first (and most important?!) such center in the world. A NYC-based commercial 3DP-cluster “HQ” would join other planet-dominant agglomerations in the City. This includes world-influencing clusters around Finance, Media, Fashion, Art—and a half dozen other business ecosystems in the Five Boroughs. To help solve the problems—and grasp the opportunities—of HC for New York and the wider world, our HC players need to commercially amalgamate their various and variegated interests. An interconnected and interest-integrated NYC HC community would empower the kind of action that the City has engendered for other industries that have prospered here. Voila! An Affiliation Group. AND, we’ve got one…! Almost five years ago, Beatrice (“Bunny”) Ellerin and Dr. Yin Ho saw the need for just such a “big-tent” trade association in the City. Now, their creation—the New York City Health Business Leaders (NYCBHL) affiliation group—boasts over 2,500 members across the entire spectrum of HC action in Metro New York. The NYCHBL membership is made-up principally of C-Suite executives among the major City HC players—broadly defined. “Broadly defined” is one of the mandates of such an organization. The fostered conversation is ecumenical, horizontal and outside the box(es)—that is NYCHBL’s fully realized intent. In the organization’s words, the NYCHBL mission is “to increase the visibility of New York as a thriving center of healthcare innovation and excellence. Through our legendary events, extensive network and other public activities, we provide a platform for the health community to communicate its immense value. “We are the premier network of [New York City] healthcare leaders, innovators, executives, professionals and entrepreneurs. “Our events bring together leaders in the field to discuss the most critical issues facing the industry. About three months ago, NYCBHL demonstrated its prescience—in looking over the horizon for the Next Big (Tech) Thing in HC—by investigating the possible creation of a first-of-its-kind 3DP/HC event for the NYC health community. I was pleased to be called on to help NYCBHL plan and organize the event—and to participate on the panel. John Meckler, Panelist (Co-Portfolio Manager, 3D Printing and Technology Fund and an executive in Mediabistro, the event developer/manager of the “Inside 3D Printing” worldwide series of 3DP trade events). My contribution included a slide deck presenting an introduction and overview of 3DP—and some of the industry’s current and most-exciting innovations in HC. I was delighted to learn by listening to my colleagues on the dais, exploring the provocative questions of Joel in moderation and joining in the incisive Q&A exchanges with the expert NYCHBL audience. My take-away confirmed in my mind the newness, speed of development and uncertainty around 3DP’s impact on HC. The foment and ferment in 3DP/HC innovation on university campuses is already changing the time-lines for progress…and, as a result, those time-lines are only getting shorter and shorter while the breakthroughs are becoming more and more startling. To date, the 3DP revolution has been driven by only a handful of pure-players in 3DP, most of whom have had the new field to themselves; now, however, four major mega-digital companies have taken notice of the obvious HC market opportunities; these digi-disruptors are Apple, Google, HP & Amazon (introducing its OWN smartphone 18 June); expect them to target the 3DP marketplace. Two Federal government regulatory initiatives will have immediate impact on the success of 3DP/HC products in the marketplace. First is the FDA (Federal Drug Administration) for all the safety issues inherent in 3DP/HC usage, partcuilarly invasive implementations. Second is intellectual property disputes around potential employment of new products based on expiring 3DP patents and the protection of “invented” objects in the reuse marketplace. Finally, several other major systemic innovations will impact 3DP/HC; these are the extremely powerful commercial forces that will be unleashed in the marketplace by the mash-up of Big Data, Cloud Computing and the Internet of Things; all of these forces will intersect at the 3DP/HC epicenter—because that’s where the money will be.